Total farm cash receipts for the first three quarters of 2018 fell on a year-over-year basis for the first time since 2010. Overall, farm cash receipts totalled $45.3 billion in the first three quarters of 2018, down 1.6% from the same period in 2017. Lower receipt were reported in both the first (-4.4%) and third (-0.5%) quarters, with a very slight increase in the second quarter (+0.3%), leading to a $755.3 million decrease over the nine-month period, with $302.1 million of the decline from direct payments. Receipts totalled $25.4 billion for crops (-1.1%), $18.4 billion for livestock (-1.0%) and $1.5 billion for program payments (-17.1%). Lower receipt were reported in Alberta (-5.6%), Saskatchewan (-4.2%), Prince Edward Island (-4.0%), Quebec (-1.1%) and Newfoundland and Labrador (-0.8%). Crop receipts decreased $274.2 million (-1.1%) in the first three quarters compared with the same period in 2017. 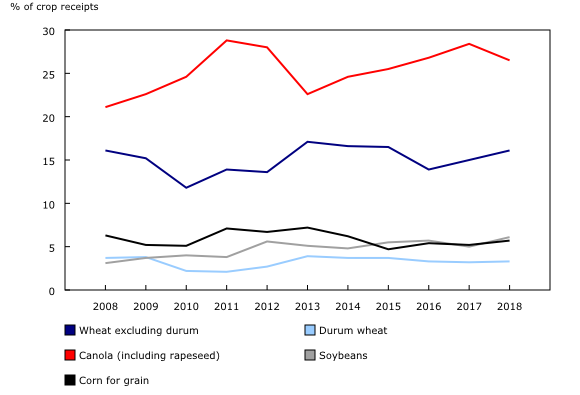 Increases in soybean, wheat (except durum wheat), and corn for grain receipts did not offset declines for canola and pulse crops. Canola (including rapeseed) prices held steady (+0.9%), but an 8.6% drop in marketings led to a $564.5 million decline in receipts after reaching a high in 2017. Decreases in both the first and third quarters of the year, partially the result of rail disruptions in early 2018, and a cool and wet harvest season, pushed back the current crop marketing calendar, particularly in Alberta. Despite these decreases, canola remained the top earning crop, accounting for over one-quarter (26.5%) of total crop receipts. Pulse crop receipts showed significant decreases as India, the largest export destination, placed tariffs on these crops beginning in November 2017. As well, India increased domestic pulse production. The result was significant price declines in lentils (-37.1%) and dry peas (-18.0%). Exports to India from January to September fell sharply for both lentils (-72.6%) and dry peas (-91.1%) compared with the same period a year earlier. Wheat (except durum wheat) receipts rose 6.3% to $4.1 billion, the result of a 5.9% price increase as both demand and quality were up. Wheat receipts increased in all three quarters due to higher prices, offsetting lower marketings in the first and second quarters. Increased receipts for corn for grain (+8.3%) and soybeans (+20.2%) also partially offset the crop receipt declines. Soybean production continued to expand into the Prairies, with receipts increasing in Manitoba (+18.3%) and Saskatchewan (+107.7%). Cannabis, a new line item in the farm cash receipts table beginning in 2016, totalled receipts of $240.2 million in the first three quarters, up 81.3% from the same period a year earlier. Receipt amounts account for sales from licensed medicinal producers. 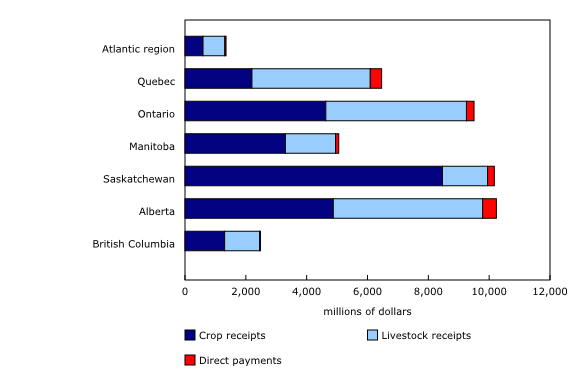 Despite an overall decline in receipts, New Brunswick, Ontario, British Columbia, Manitoba and Newfoundland and Labrador all reported higher crop receipts. Ontario had the largest increase in terms of value (+$300.8 million), due to increases in corn for grain and soybeans. Manitoba saw major increases in receipts for canola, wheat excluding durum and soybeans. Horticulture drove increases in crop receipts for British Columbia (+6.0%) and Newfoundland and Labrador (+1.2%). Cannabis was the main contributor for the 9.5% crop receipt increase in New Brunswick. 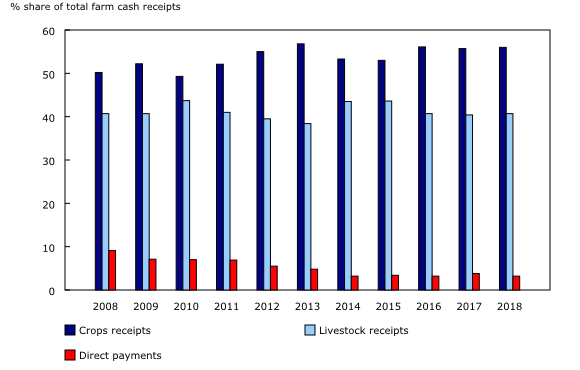 Total livestock receipts decreased by $179.0 million from January to September compared with the same period in 2017, driven by a $383.5 million decrease in hog receipts. Receipts for supply-managed industries, representing just under half of total livestock receipts, totalled $8.1 billion, up 2.1% from the first three quarters in 2017. The main sectors contributing to this increase were chickens (+5.1%) and eggs (+6.0%). Hog receipts declined by 11.0% in the first three quarters compared with the same period of 2017. Slaughter receipts, accounting for 89.1% of the total, declined by $342.3 million due to lower prices (-16.7% in the third quarter) as a result of retaliatory pork tariffs imposed by China and Mexico on the United States, which drove down North American prices in the summer. Higher cattle and calf receipts were driven by an increase in the number of head slaughtered (+5.7%), despite lower prices (-2.8%) and fewer animals exported (-3.2%), as international beef exports continued to be strong in 2018. 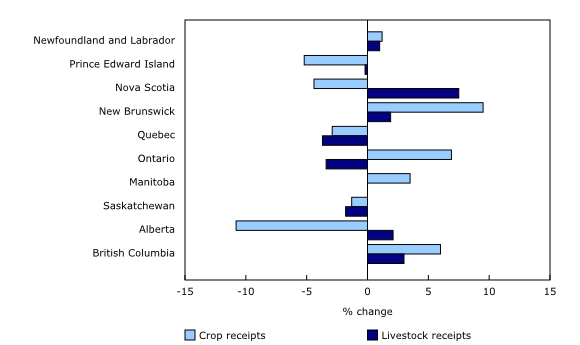 Livestock receipts decreased in Quebec (-3.7%), Ontario (-3.4%), Saskatchewan (-1.8%) and Prince Edward Island (-0.2%). 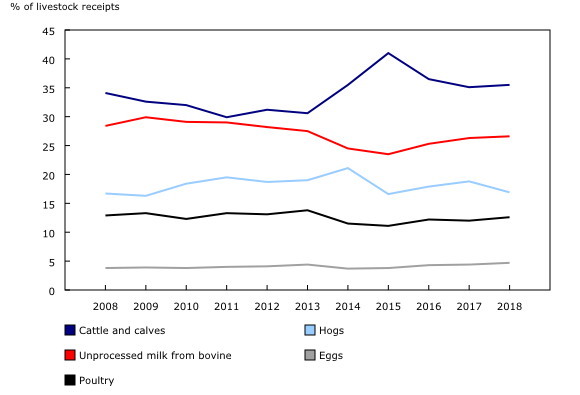 Cattle and calf receipt declines drove the decrease in Prince Edward Island (-7.4%), while lower hog receipts affected Ontario, Quebec and Saskatchewan. Program payments totalled $1.5 billion in the first three quarters, down 17.1% from the same period in 2017. The majority of this decline was in crop insurance in the first quarter in Saskatchewan, as 2017 harvest year conditions improved over what was experienced in 2016, when an estimated million acres remained to be harvested at the year. All data in this release are in current dollars. Farm cash receipts measure the gross revenue of farm businesses. They include sales of crops and livestock products (except sales between farms in the same province) and program payments. Receipts are recorded when the money is paid to farmers. These do not represent their bottom line, as farmers have to pay their expenses and loans and cover depreciation. Farm cash receipts are, for the most part, based on monthly marketings and the monthly prices of various commodities. Marketings are quantities sold, using various units of measure. Data are extracted from administrative files and derived from other Statistics Canada surveys and/or other sources. These data are subject to revision. For details on farm cash receipts and net farm income for 2017, see the "Farm income" release in today's Daily. As a result of this review, revisions back to 2010 are now available and are reflected in the data in this release.